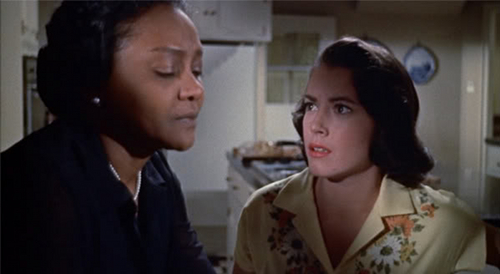 I was given an assignment – to submit an essay discussing Douglas Sirk’s 1959 melodrama, Imitation of Life in a “Career Women in Film” course I took some time ago. Since the topic didn’t thrill me, I submitted the following essay, which certainly addresses the topic but also includes some, shall we say, melodrama of its own. This past week I had the privilege of stepping back in time when I attended a re-release of Universal’s Imitation of Life celebrating the film’s 50th anniversary. Appropriately, this re-release was celebrated at what is perhaps one of the last bastions of the movies’ hey day, New York’s Ziegfeld Theater. 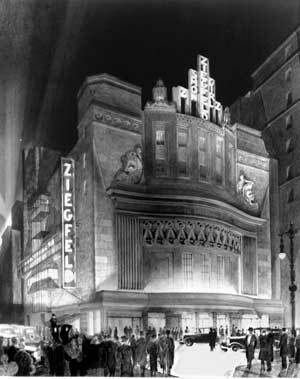 Although this theater is just feet away from where the original Ziegfeld Theater stood, it manages to capture the feel of the old movie palaces with its balconies, red carpeting with gold trimming – a feeling completely missed today in the world of multiplexes. Sitting in my seat, waiting for the plush curtain to open and surrounded by women who seem eager and familiar with this story, I couldn’t help but wonder about how many of them had attended theaters in 1959 to watch this movie in its original release dressed in their finest clothes and on the arms of their escorts. As it is with all that is old Hollywood, this film put together with this theater is a total experience. 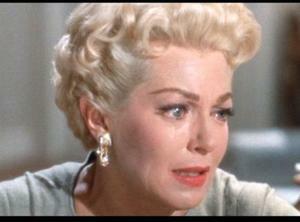 Imitation of Life was intended to be just that and should be enjoyed as such, an experience. Having seen this film before on video I looked forward more to the big screen experience of the film than I did the film itself – I was pleasantly surprised. Though dated in many ways, the tears and emotions and punch are all still palpable. There’s a lot to be said about a movie that represents the glamour and emotions of a whole generation of women that survives the test of time. As Annie says about her long suffering daughter in one of the film’s best lines, “How do you explain to your child she was born to be hurt?” Well, how do you explain to an audience you are here to feel? This film doesn’t explain it; it just makes you do it. 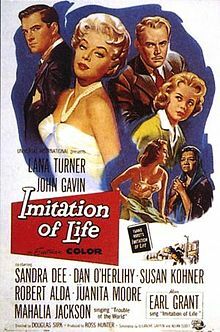 Imitation of Life is a film that deals with several serious issues like racism, female relationships, mothering and career choices but one is never fooled into thinking the “look” of the film is not as important as its content. Stylistically, the film directly parallels its plot in that appearances are what truly matter as they are often how people are judged. The appearance of this film has a lot to do with how it too is judged. The colors are vibrant and seem somewhat surreal. The clothes, in particular those worn by Lana Turner, are gorgeous and glamorous – from the beginning when she is struggling financially to the very end when she is a famous actress. It is hard to ignore the fact that Lana Turner, the big Hollywood movie star, is as important here as is Lora Meredith, the role she plays and the protagonist in this film – testament to the time when this movie was produced when the Hollywood stars were American royalty. 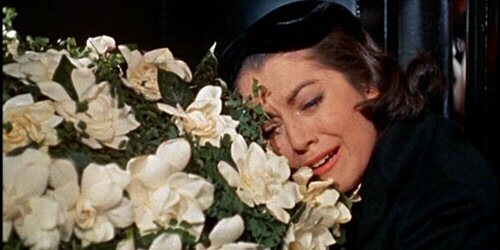 Douglas Sirk knew what it would take to take us on a journey with this film – and the journey is exactly as he maps it out. The parts of this film, if taken separately are almost silly at times, completely over the top. But together they make a nice, if overly dramatic, package where we know what’s in it and what to expect, but we’re still excited about the unraveling. We still reach for the tissue before we feel anything but lose none of the feeling once it appears. 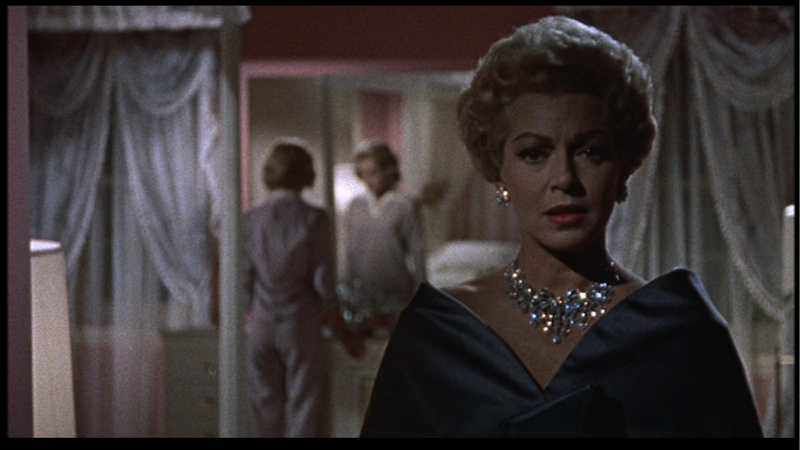 Forget the three-hanky movie thing – this was a 17-tissue film for me and simply said that’s Sirk’s gift of manipulation. I don’t doubt, and wouldn’t be surprised, if that next time it’ll take me 18 tissues to get through it. Much has been said, in discussing this film, about its running theme being the fact that the characters live imitations of life (I’m sure you think that’s a brilliant mention on my part). That is, they don’t live realities in many ways. Lora who is an actress, pretending all the time, pushes her real responsibilities pertaining to her daughter aside just as she does the love of the man. Sarah Jane lives an actual lie by pretending she is a white woman despite the reality that is always thrown in her face. Susie lives her “pretend” life in that her mother is actually Annie in all that pertains to being a mother and then transcribes that love toward a man she knows would never love her, wanting in kind to replace her mother’s love with his. The only character who lives the reality of a life, and not an imitation of one, is Annie. She accepts her burdens and those around her for what they truly are. Suffice it to say that her life and the fact that she’s lived it to the fullest is illustrated by the celebration of that life in her death. The church is full to capacity and she reaps the rewards of a life well lived by the love, admiration and friendship that is now shown to her memory (even by the milkman). This brings to mind a line from The Color Purple that is so appropriate here – “I think it pisses God off when you walk by the color purple in a field and don’t notice it.” Annie shows us that we’re supposed to notice all, appreciate all no matter how small or insignificant that “all” may be. That is how not to live an imitation of life. And that is the real moral of this story. 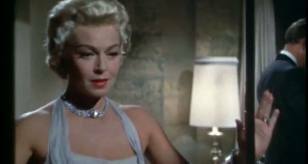 It would be remiss not to mention another aspect brought forth by Imitation of Life – the fact that the main character, Lora Meredith, is a career woman, much in the same way a man would be a “career man.” By this I mean that she allows her personal and family lives to suffer as a result of her dream of a successful acting career. In fact, she chooses her career over her own daughter and personal happiness throughout the film, things that are often considered “male” traits. By today’s standards these choices seem almost non-existent as women are forced every day to balance both a family and a career. But as is true with many Hollywood productions, a woman is unable to balance both and one always has to suffer as a result of her choices. It is difficult to pinpoint this fact as a “Hollywoodization” in a film that is “Hollywoodized” to a tee, but clearly it is one of the more significant aspects of how women are portrayed in this film in regards to the time it was produced and the time depicted in the film. Also interesting is the fact that such an obviously female character – with her glamorous clothes and sparkling jewelry – should make the choices she makes throughout the film. This character never depends on a man, and in fact, her career aspirations far exceed those of the main male character in the film, Steve. She survives a bout with the “casting couch”, ageism and constant referrals to how pretty she is but becomes a “real” actress despite the odds against her – all attesting to the power of women, which is as important as anything else in this story. Along with the filming style, music, sets and wardrobe, the acting is of similar caliber, overdone. But, as with all else that pertains to this film, it fits. There are plenty of furrowed eyebrows, wide-eyed stares, sobbing into hands and the like – all that which border on the theatrical. It is all overdone that is, with one major exception, Susan Kohner, as Sarah Jane. I should mention here that I think Juanita Moore is excellent as Annie Johnson. However, in contrast to the Annie role, the role of Sarah Jane demands much more explicit acting in that this character demonstrates the entire spectrum of emotions, whereas Annie is long suffering and serene throughout the film. There are many scenes that call for that tissue or hanky to be at hand – Annie’s death scene and the funeral scene where Sarah Jane calls out “mama, I didn’t mean it. 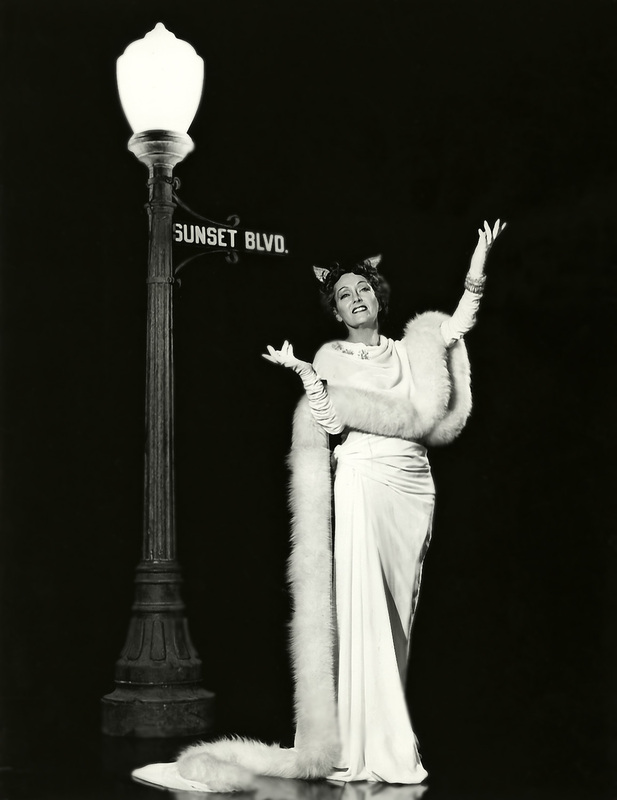 I do love you.” But the one that best demonstrates Ms. Kohner’s acting skills and the scene that most grips at my heart is the one in the dressing room in Los Angeles, where Linda (Sarah Jane) just got off stage after the production number and Annie has come by to say her goodbye. Annie is clearly tired and quite ill. Sarah Jane is also visibly tired of running but has all intentions of continuing to do so in order to continue to live the kind of life she wants. When the exhausted Annie asks Sarah Jane is she minds if she sits a moment Sarah Jane rushes to obstruct the chair and says “yes, I do.” Jesus, that hurt – both of them – as we see Sarah Jane’s face distort when she looks away briefly so as to disguise her pain and anguish. And when they hug after some words and the pain and love is evident in Sarah Jane’s face and then when they say goodbye and Sarah Jane whispers “goodbye mama” so as not to let on who the black woman really is who is leaving her – I mean, WHEW, I’m misty-eyed even now. Susan Kohner’s is the meatiest role in this film and it easily translates to the meatiest performance. I might add I’ve read other people’s commentary stating that there is much overacting in this film, the worst being by Susan Kohner. I disagree. Or, perhaps disagree that it doesn’t work in the film. For many of the reasons I’ve already mentioned, subtle acting wouldn’t work. Is it shameless? Perhaps. But no more than all else. It is a melodrama and intended as such. Apparently the Academy of Motion Pictures Arts and Sciences agree with me as both Juanita Moore and Susan Kohner received Supporting Actress nominations. I think, well deserved. Could be I’m a sucker for feeling – no matter how contrived. 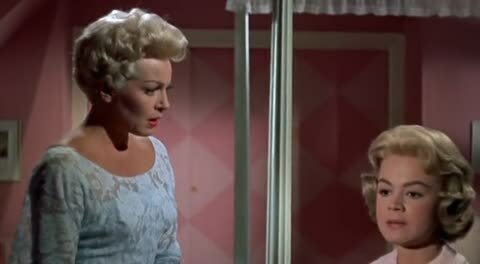 As with all melodramas, Imitation of Life is replete with victims – all victims of life, whether by choice or circumstance. Almost shameless is the way we are brought into this world to become victims as well. 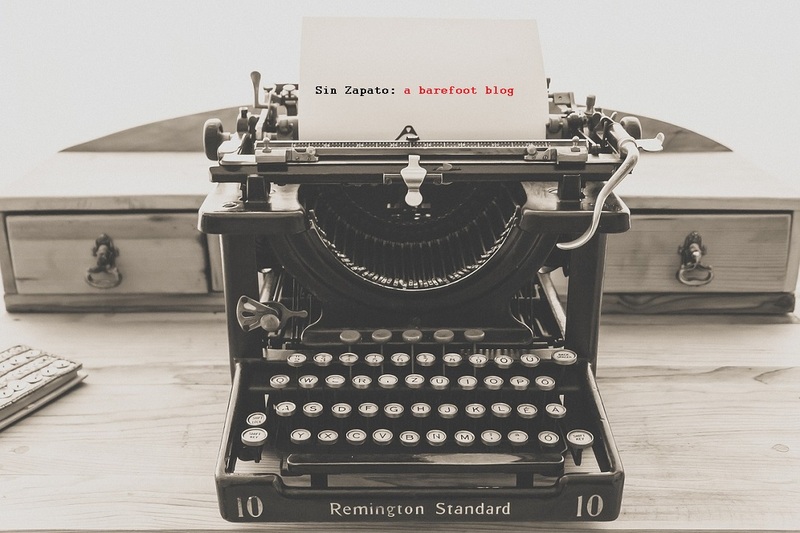 There is nothing subtle here and our emotions are just part of the package, they are expected and realized with as much subtlety as a freight train – but still we willingly go along for the ride with tissues in one hand and bracing ourselves for the bumps in the road with the other. Perhaps some would say that is a lot like real life – there is irony in there somewhere. After the film was over, I stepped out onto crowded 54th Street with its typical New York City energy, sights and smells. Not unlike what happens to Marty McFly in Back to the Future, I expected to see 1950’s billboards and announcements pertaining to a much simpler time. The realism I now faced outside was in stark contrast to what I felt inside, which lead me to think about how much we miss out on in films today, where senses are often overwhelmed and where substance often suffers as a result. No longer do we accept things as fact just because we are told to, no longer is sobbing into ones hands acceptable as believable, no longer does a man who looks like John Gavin wait for years for the woman he loves. Today we need to see the blood and guts in order to even think they are there. Imitation of Life may imitate a lot of things about life but it doesn’t imitate what a film should do – that is, entertain us and make us feel. 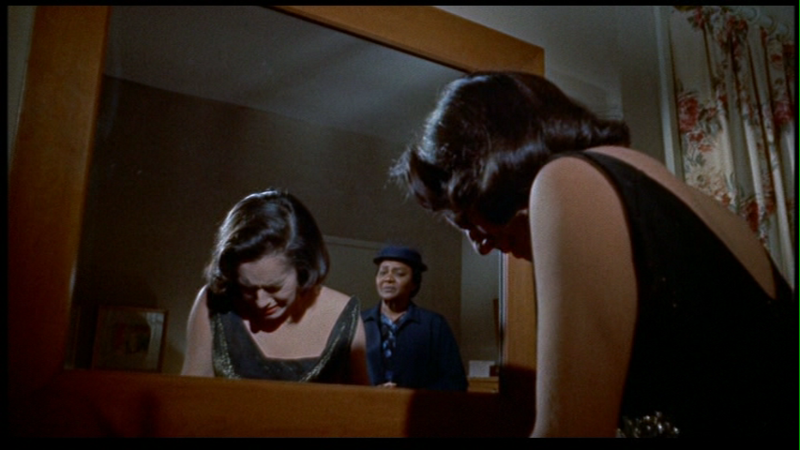 There they are, my thoughts and comments on Imitation of Life as a student. I am now compelled to tell you that I never saw this film in a theater. To my knowledge it was never released in theaters nor was it shown at the Ziegfeld. I’m not quite sure why I added that imaginative part to the essay, but if memory serves, it was what my professor liked best. Fabulous piece, Aurora! I’ve been forbidden to see this movie again – at least in the company of others. It’s the one that reduces me to a noodle everytime. I mean choking sobs and too many tissues. At Annie’s funeral scene of course. I’d almost forgotten about that dressing room scene. 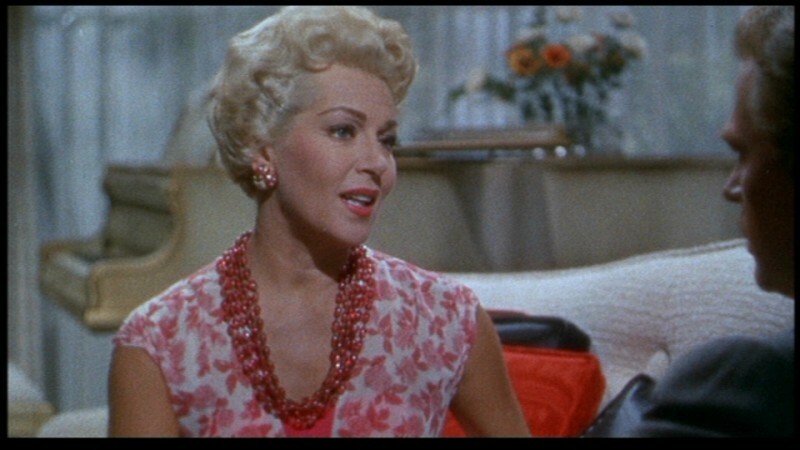 Lana Turner’s over-the-top acting in this film used to bother me, until I realized that Lora was simply constantly in character, on stage and at home, so here it worked. Lora was also a sad and shallow character to me, not to realize just how involved Annie’s life was outside of her home. I have an old copy of the book I’ve been dying to read, to see the similarities between Hurst’s tale and Hollywood’s Claudette Colbert’s version and Turner’s, to hopefully get Hurst’s take on women in family vs. career in the early 20th century. BTW, I loved your theatre view, too. Thanks, Tonya! Yeah, overacting and all it just works for me as far as it being a super-tear-jerker! Can’t help it! I’d love to compare notes between book and both movie versions also. I haven’t seen the Colbert film version in years. Interestingly, this story was also made into a Spanish soap opera that I watched as a child with my grandmother. Same story drawn out for eons, as you can imagine. Great film but I always preferred the Colbert version to this one. Honestly, I don’t love either but like them both. Also always remember a Spanish novela production of the same story that I watched as a child with my grandmother. I think I have most affection for that.